*Pardon the silence of late. We're still knee-deep in boxes and take-out. So close to rolling out of Chicago. Le sigh/exciting! I'm becoming more and more convinced that panna cotta is the world's greatest dessert gift to entertainers. Luscious texture. Decadent creamy flavor. Advanced prep. Endless variety. Seriously? Does it get any better? For my most recent baby shower, I opted to make a variation with bright fruit flavors for spring. Another reason to love it? You can haul these puppies from your house without a worry of spilling. Amazing! The ingredients really are simple -- milk, sugar, cream, gelatin and flavorings. 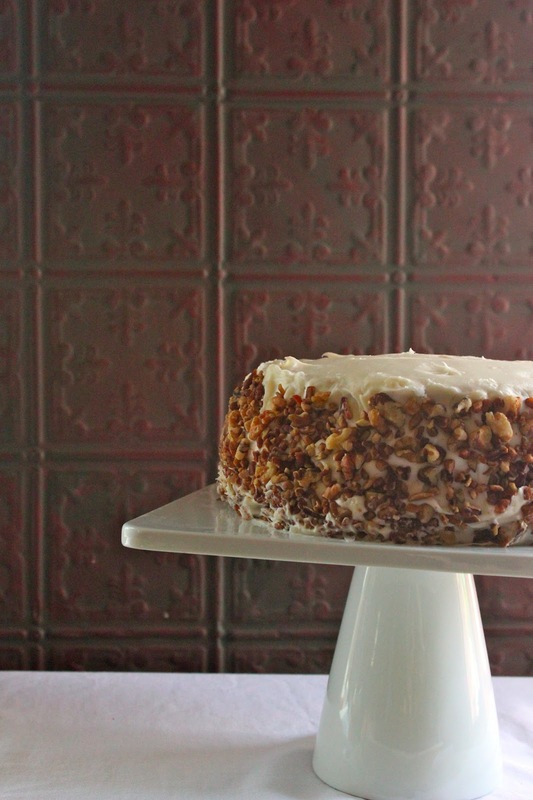 Perhaps it was because I was making a few other complex, ingredient-heavy desserts for the party, but the simplicity of this really spoke to me in preparing this. Sometimes the simplest things are most intriguing to our palettes; stripping away taste overload, honing our over-amused taste buds to pick out individual flavors. 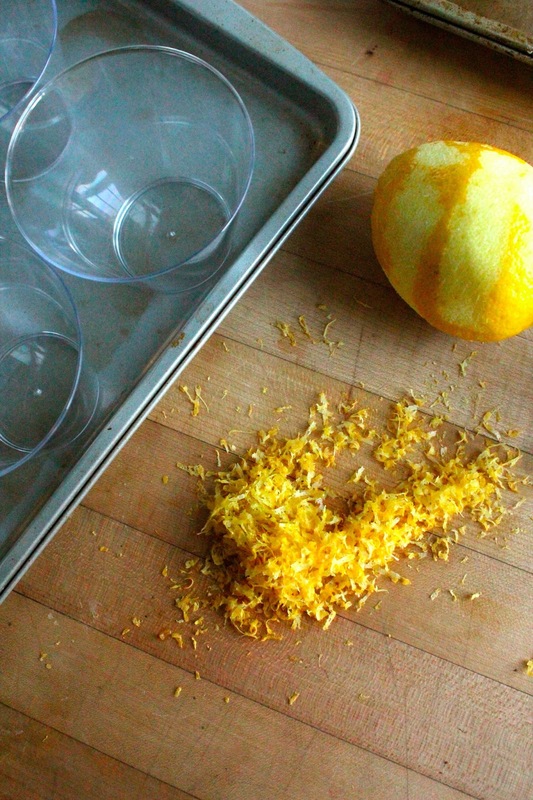 Lemon zest is the star here. And don't be shy.... you really want the brightness to pop through in each creamy spoonful. 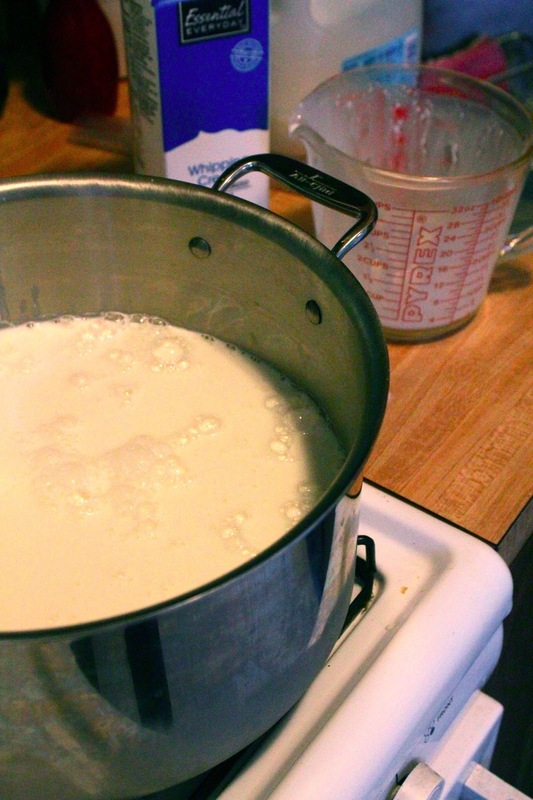 A quick bout on the stove brings together milk, cream, gelatin and sugar. Just until steaming. 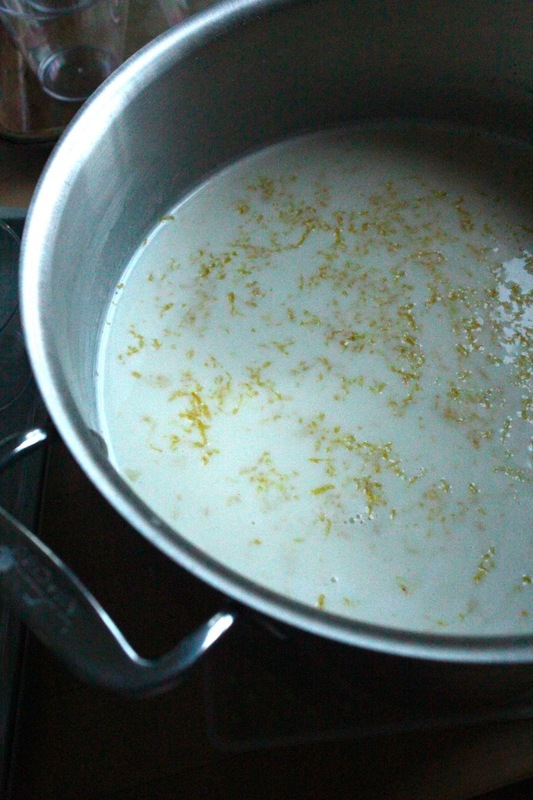 Allow the cream to cool with the lemon zest, oozing and infusing flavors together. Once cooled, simply ladle into serving cups and refrigerate overnight. 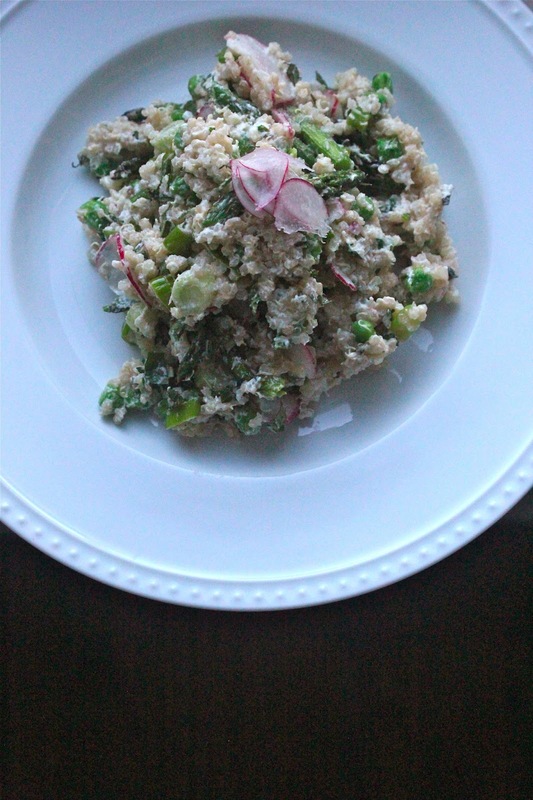 You can even make these two days in advance and save yourself some much-needed pre-party sanity. Hold off on saucing these desserts until just before serving. This will also make transportation about a thousand times easier. 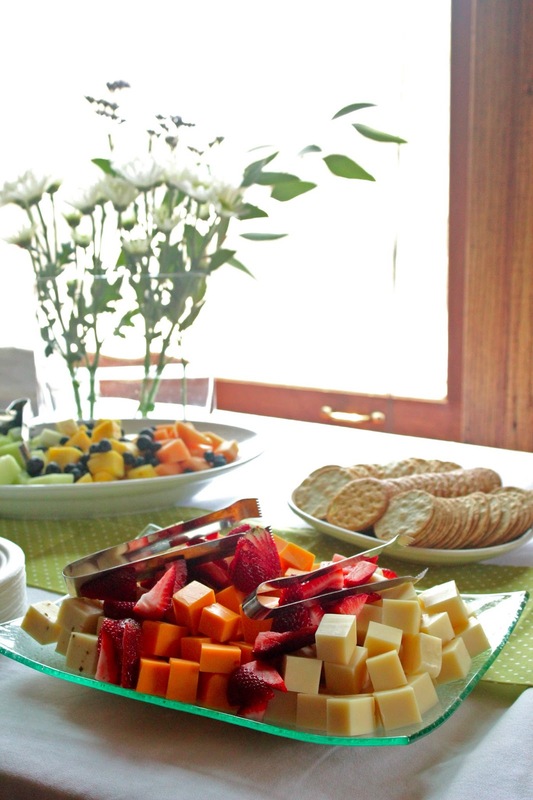 For a pretty serving, line up the little soldiers in a rimmed tray. Pour milk and cream into large pot and sprinkle gelatin. 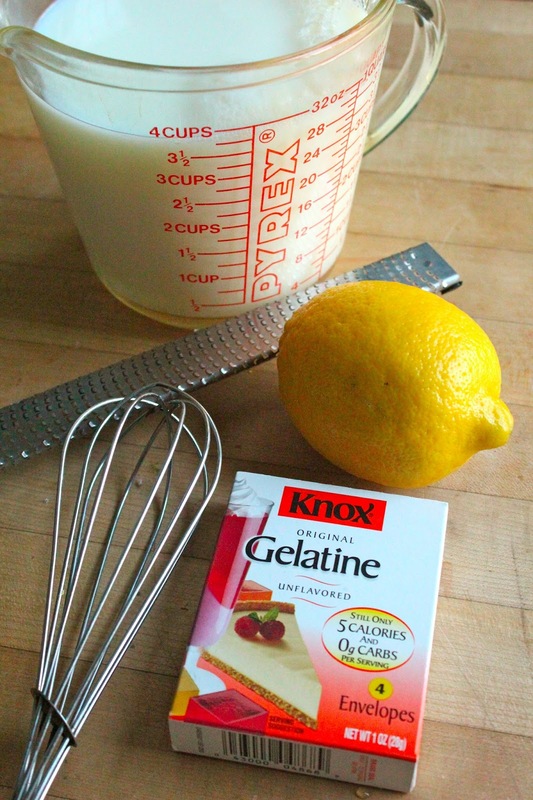 Turn heat on low and stir until gelatin dissolves completely. Add sugar; stir until dissolved and continue just until milk begins to steam. Remove from heat and add lemon zest. Allow to cool for 30 minutes before ladling into small cups. Place plastic wrap on the surface of the milk and smooth out wrinkles. Refrigerate overnight. Combine blueberries, sugar, lemon juice and water in small saucepan and bring to boil. Reduce heat to simmer and stir occasionally while sauce reduces, about 15 minutes. Strain if you desire a smooth sauce. Allow sauce to cool completely. 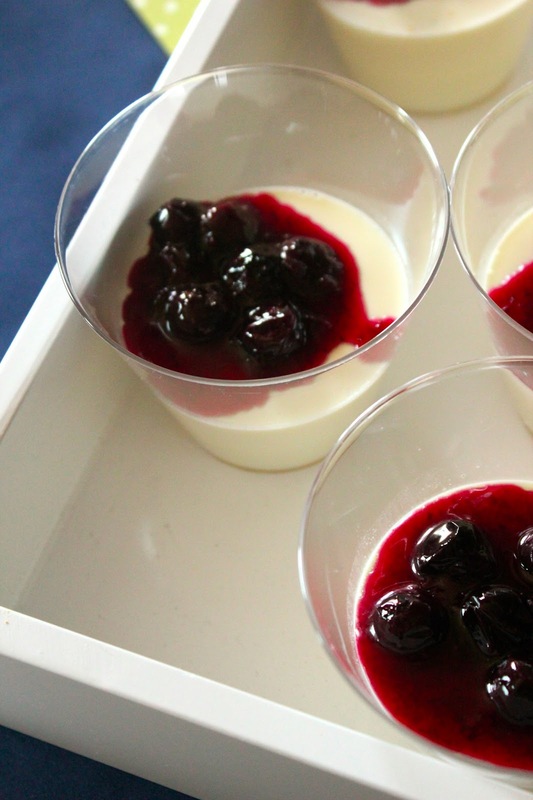 Remove panna cotta from refrigerator 15-30 minutes before serving and top each serving with a spoonful of cooled sauce. In the midst of all the moving craziness, we still wanted to make time to celebrate with our Chicago friends. One of my dearest friends is expecting her first child, so I was honored to co-host a couples baby shower for she and her husband. We met as PR interns and caused some serious ruckus in this town for a few years, so naturally we hosted this fete at a bar. Just kidding, our house is in shambles and it was a large party, so we opted for the private party room at a local pub. In an effort to keep things more casual for the dudes and to keep costs reasonable, my co-host and I decided to do an early afternoon dessert shower. Since it wasn't at mealtime, we felt comfortable only offering snacks and desserts. And WERE there desserts! Oh my! Full menu below. I contributed the Carrot Cake, Mixed Berry Mascarpone Tart and Panna Cotta, with my co-hosts tackling the cupcakes and cookies. 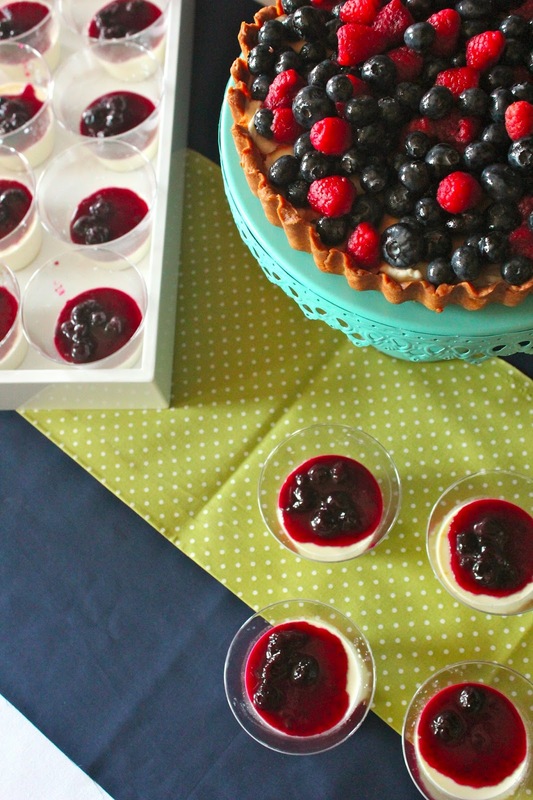 Recipes to come for the Tart and Panna Cotta. Those were the real winners! My friend is planning a nautical-themed nursery, so I tried to pull-in those colors in the decor. The table linens were a quick hem-tape job and I made the flag pennant as my gift. 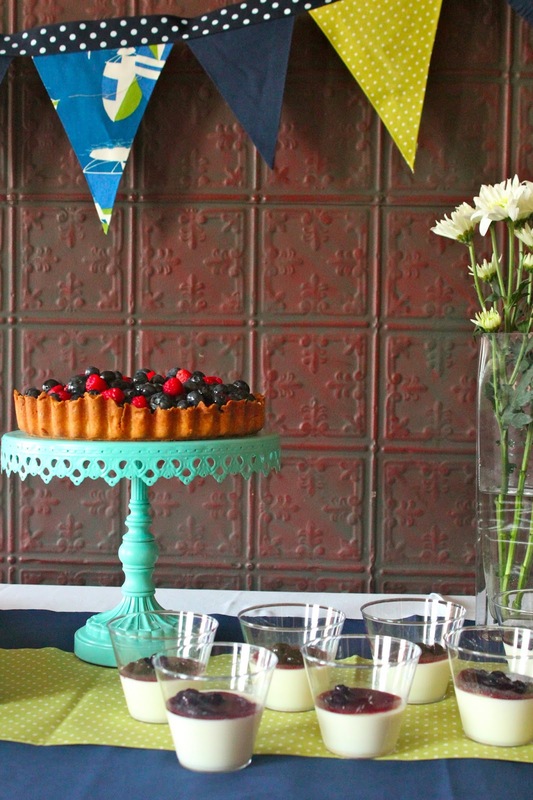 Love when party decorations can be reused! How cute is this gal? It was such a pleasure to celebrate the coming babe. Sorry social media, for once you're the last to know. That's right, the Husband and I are packing up and moving to St. Louis. After 10 years for me and four for the Husband, getting kicked out of every bar on the north side, (almost) winning a 16-inch softball championship, surviving snowmageddon, voting twice in every election and managing to never eat deep dish pizza on a regular basis, we've given this "Sweet Home" all that we've got. Let me be clear... we still have nothing but love for the Chi. Alas, the pull of family, friends and affordable real estate was too tempting to pass up. Moving was always in the plans and when an opportunity with my company came up, we knew it was the right time. Everything else has fallen into place with relative ease, which has been such a positive reassurance that this is what we're supposed to be doing right now. We've been telling our friends in Chicago and St. Louis for the past few weeks and I'm getting a lot of the same questions, so I thought I would draft a handy dandy Q&A for you guys. I'm from there. I moved to Chicago to go to college and have lived here ever since. My family lives in St. Louis and the Husband's family will be in driving distance. So what are you guys doing for work? 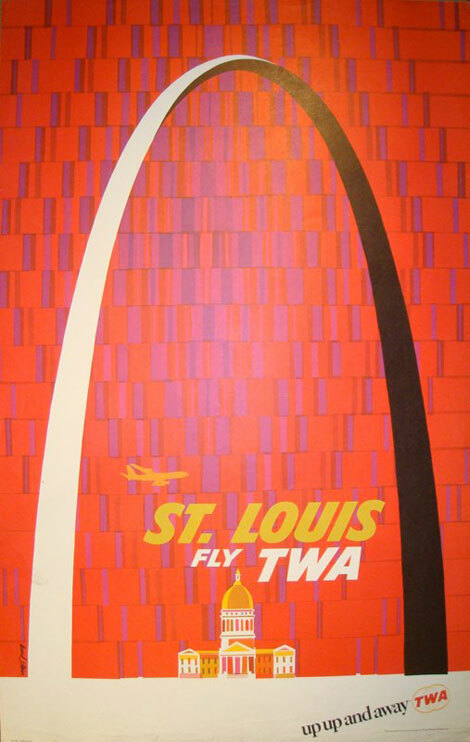 I'm staying with my current company, but will make the transition to work on St. Louis based accounts. It's a smaller office, so will be a change of pace for me. It's also a dog-friendly office, so hello Howard the Intern. We've been extraordinarily blessed that the Husband was offered a new job that will have him working from home (so much time for marinating!). Are you moving in with your parents? Buying a house? No to both. We found a jazzy new loft to rent. Moving across state lines was enough to think about, so maybe we'll tackle our first home purchase next year. What about your kitchen? Finally getting that ice-rink-sized slab of granite? The new kitchen is bigger, but still not huge. But wait for it.... it has a dishwasher! Amazing. I'm also going to have an electric stove, so I'll be sure to let you guys know what I think of the comparison. Which will reign supreme... old busted gas stove or newer electric? I'm sure you're on the edge of your seat waiting to know. Plenty of pictures and decor posts to come. Are you sad to leave your pathetically small kitchen? Yes. Sundays are a pretty big deal in the Morgan household. I cook and the Husband and I listen to Wait, Wait, Don't Tell Me on NPR. We've spent the first years of our marriage in that tiny kitchen, making everything from quick weeknight meals to the fuel of legendary parties. That tiny ill-equipped kitchen has seen a lot of action in the past three years and was the starting place of this lovely blog. Even when they're small, kitchens are the heart of a house. I found myself tearing up when we started packing boxes. It will always be a special place for me. Nope. I'm going to use this as a soapbox (it's my blog after all)... stop asking people you don't know well this question. While we're not at that stage of our life yet, you never know what someone is going through. 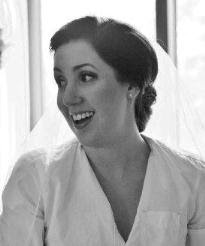 If I've learned anything from my fab Mom friends, it's that deciding to start a family is an intensely personal decision and sometimes complicated process. I think Sherry over at Young House Love put it so well. One life change does not necessitate another. 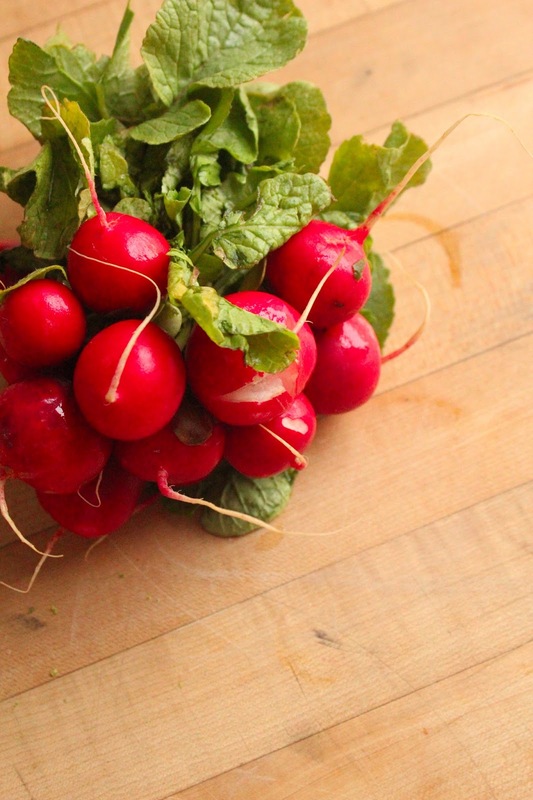 What food stuff are you going to miss in Chicago? The plethora of ethnic restaurants will be tough to leave. Heck, the plethora of restaurants in general; we hardly ever repeat a date night. And sausage... this town knows sausage. What food stuff are you excited about in St. Louis? Real BBQ for one. Sorry, it only gets better the further south you go in this country. We'll also be living in walking distance of Historic Soulard Farmer's Market, which will be so fun to shop at. Better produce in general too, everything in Chicago grocery stores always seems to be a day-too-ripe. Are you capable of maintaining a regular blogging schedule whilst moving across state lines? Not really. We're going to make the most of our time left in Chicago and therefore the posting schedule may get bit sparse for the next few weeks. I'll try my best to keep going, but I see some pizzas and Thai take-out in our future. So here we go... let's mix this up. Get crazy, Midwestern-style. More Nelly. She be grillin'.... ooh yeah... she be grillin'. 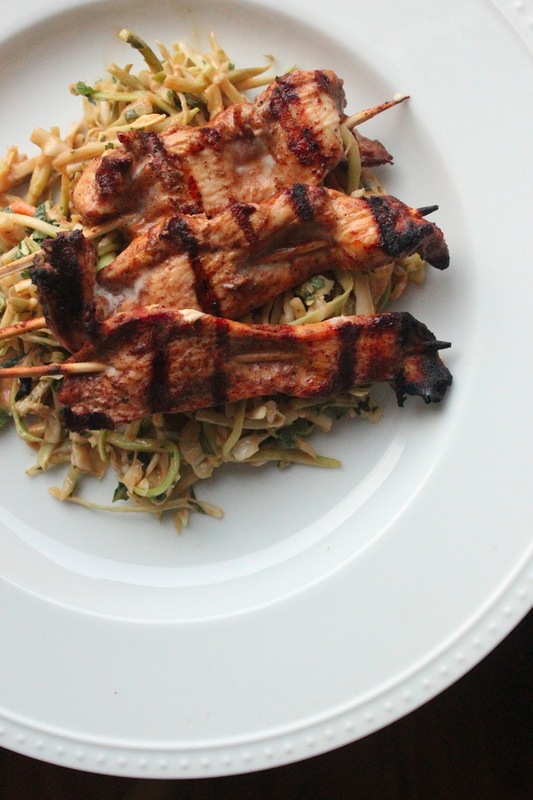 Combining the flavors of Asian takeout with the fresh char of the grill. Good heavens I'm a happy girl. 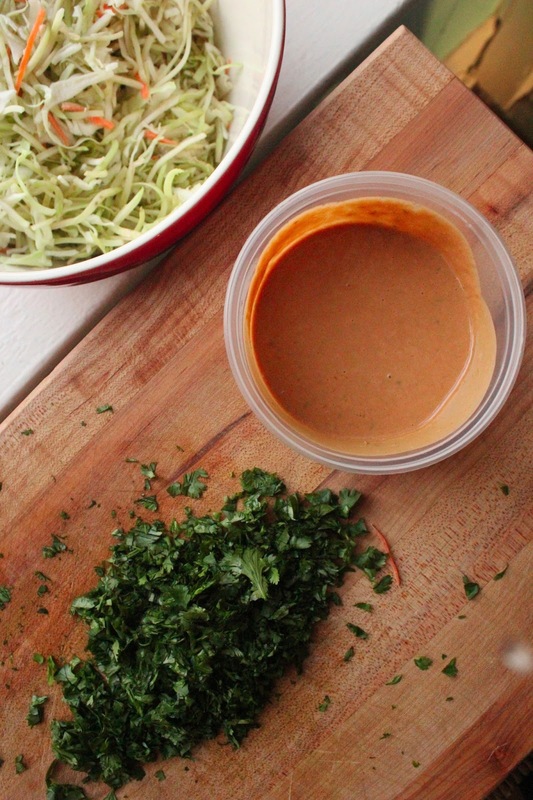 Peanut and soy sauce not only make a fabulous marinade, they're a perfect dressing for a crunchy slaw. 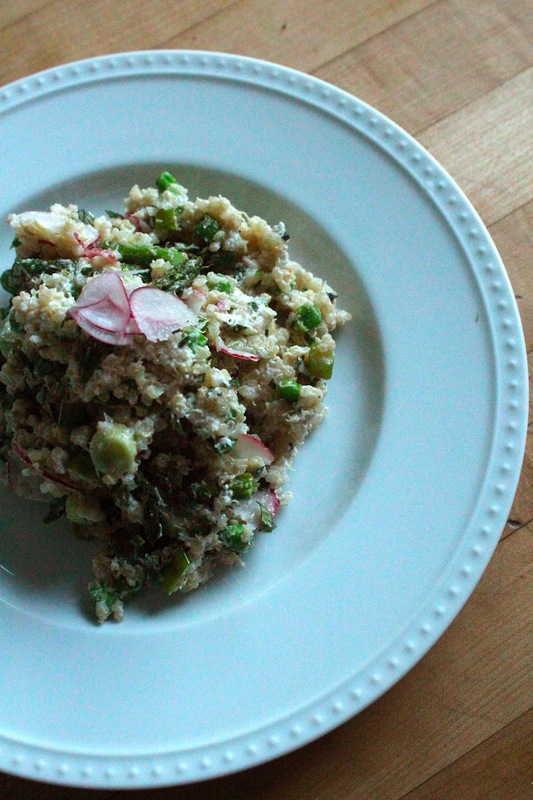 One sauce with two uses make this an easy weeknight dinner. Not to mention these chicks grill up in 5 minutes. 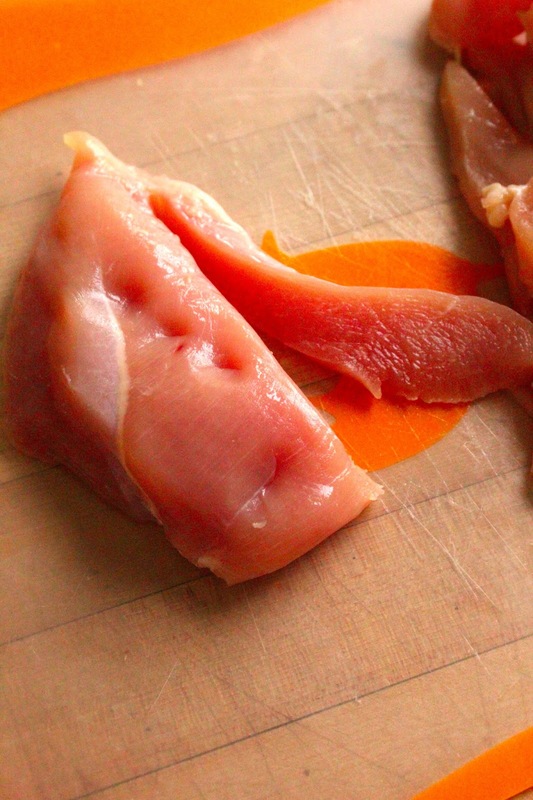 Slice the chicken into 1-inch strips... taking care to ensure they're about the same size. This will keep your grilling times consistent. The marinade/sauce has great balance -- sweet from peanut butter, salty from the soy sauce, hot from sriracha and bitter from the lime. For an extra punch on the chicken, add some 5-spice powder before the marinade. Let this party go on for an evening for lots of flavor. I notoriously forget to soak my wooden skewers ahead of the grill, so I am getting a pat on the back for remembering this time. Go Carey. You're learning. 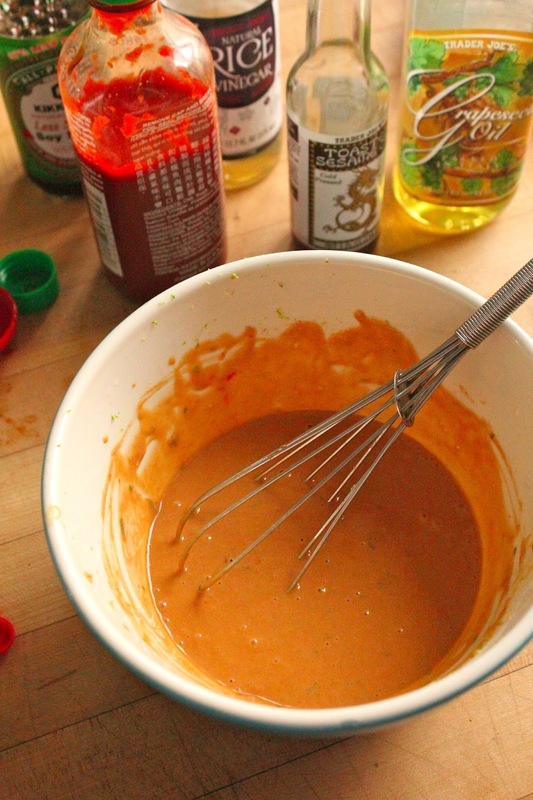 Mix together peanut butter, lime zest, lime juice, soy sauce, rice vinegar, sesame oil, sriracha and grapeseed oil. Toss chicken slices with Chinese 5-spice powder and then cover with half the sauce. 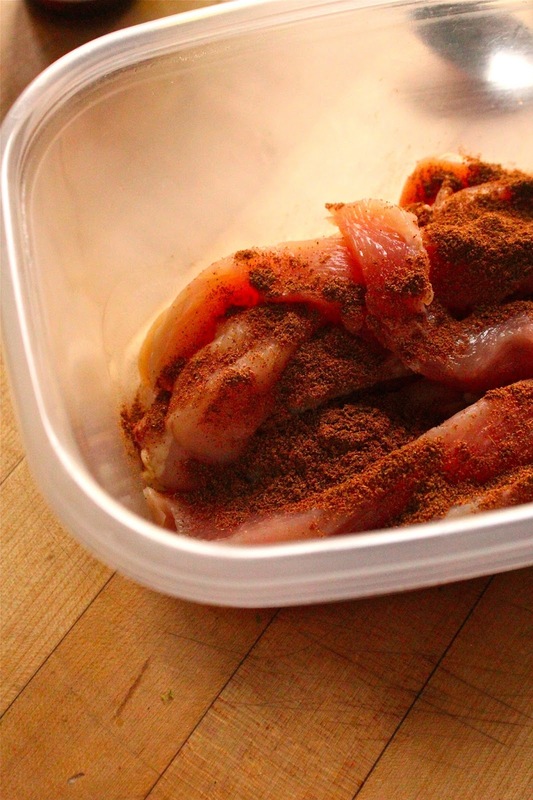 Allow chicken to marinate in the refrigerator overnight. Reserve the remaining sauce in a covered container. Preheat grill. Cover wooden skewers in water and let soak for at least 15 minutes. 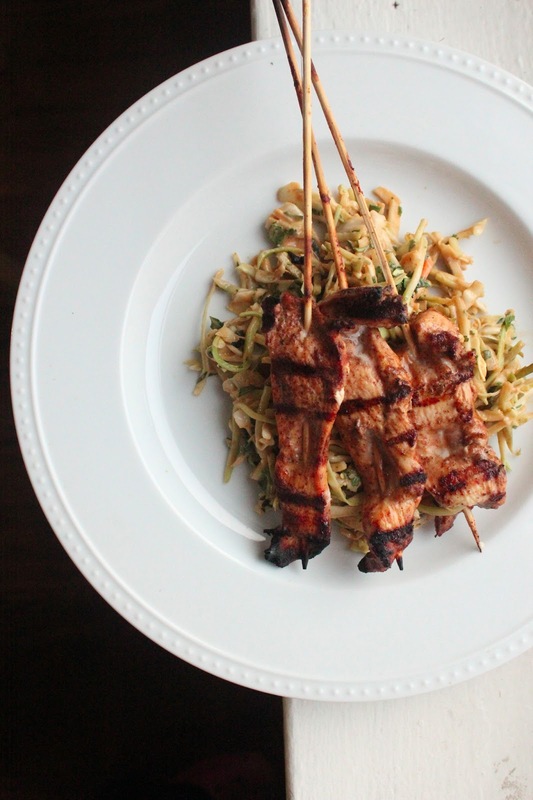 Skewer chicken slices, one on each skewer. Grill over medium, direct heat for 3 minutes on each side. While chicken rests, combine cabbage, slaw mix, cilantro and remaining dressing. Toss and serve with chicken.